The Tenacity Grit is a stronger version of the original Tenacity. It reads earlier in the midlane area while still providing good backend recovery. This ball is not the earliest of reactions but is not allergic to oil. This ball will provide you with the ability to play in the oil and create angle to the outside part of the lane. So far, I have found the Tenacity Grit to perform best when my heavier oil balls are starting to be a bit too early. This one is a step down from balls like the Kingpin Max and the Quantum Bias. The Tenacity Grit also works very well when used in the oilier part of the lane on fresher house conditions. Overall, the Tenacity Grit adds versatility and continuation to the Brunswick lineup. If you are looking for length and continuation on moderate to heavier conditions, take a look at the Tenacity Grit. After rolling the Tenacity Grit, you're going to think you're throwing a ball with snow tires on it. This ball really bites the lane and has a beautiful shape to the pocket. What's really great about it is that it doesn't hook early or burn up, it just powers right through the pins. For bowlers like myself that don't have a high rev rate and sometimes struggle getting the proper shape, this ball addresses those concerns above and beyond. Mine is drilled pin under middle finger. Oil does not challenge this ball. You can freewheel it and it will respond. A great piece and a complement to your arsenal if you run into a fair amount of volume. I’m a huge fan of the original Tenacity and so I was super excited to get chance to throw the Tenacity Grit. I have found great success with this ball on heavier volume patterns and longer patterns. This ball is really clean through the front and continuous on the backend. This ball comes with a 500 – 1000 – 3000 finish. I haven’t done any surface adjustments to this ball yet but I’ve been so pleased with the initial reaction, I haven’t wanted to change it. 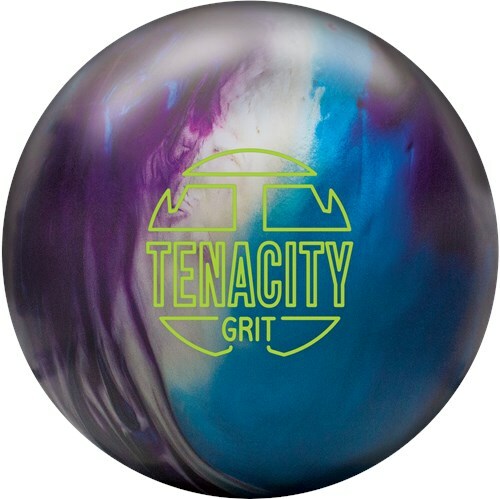 The Tenacity Grit fits into the Pro/All Purpose category meaning that the ball utilizes Brunswick’s most advanced technology and is a versatile ball across a variety of lane conditions with a continuous strong arcing motion. Likes: This ball is strong but very predictable. It reads earlier than say a Vapor Zone or Method but is pretty continuous. You will need some volume for this ball as the cover is very grippy. Polish will get it down the lane more. But it’s a very good piece, especially when you need some grip when the lanes are tighter or when there’s plenty of volume in the front of the lane. Dislikes: Ball can tend to be a little lazy on the back end when the fronts get tricky. 70 x 3 3/8 x 35 drilling. I’ve been very impressed with how strong this ball is, and it has allowed me to play on a variety of oil conditions. This ball will get going sooner then the original Tenacity and have a strong arcing motion to the pins. The predictability and hitting power of this ball makes it a quite impressive piece. This will definitely be a benchmark ball for league patterns, and its versatility will appeal to numerous bowling styles.Feel free to contact me by email with any questions; troy_300_1999@yahoo.com. I'm new to Brunswick staff this season and didn't get a chance to throw the original Tenacity,so I don't have a good comparison. I went with a taller, weaker pin looking for a specific ball to have in the bag. What I found was that on a tighter condition, I can play straighter and get good traction in the midland without the ball burning off and losing hitting power. With the weaker layout, it let me play in the zone a bit longer when other players were getting pushed left and having to navigate a "cliffed" pattern. Not my most versatile piece, but one of the stronger balls in the bag. If my Kingpin Rule is too much motion, this is the next ball down but definitely stronger than Method, Fearless or Vapor Zone. Out of the box this ball was an absolute tank - really dull, early rolling and typically out of energy by the time it got to the pins. As much as I want to keep the ball at box finish for tournaments, it was too strong for me to keep the ball in front of me. I hit it with a 3k pad so that I could get it a little further down my lane and found it very effective on fresh in our challenge league which at the time was on 45' Route 66. This quarter we have been on 41' Beaten Path which has been very snappy off the back ends on fresh. I have since added polish (which I very rarely do) and love the reaction I see, giving me the traction I need up front, but still that smoother downlane shape that makes it easier for me to stay in the pocket. By the end of game 2, I typically have burnt up the heads and need to either take a step left or ball down to one of my midrange balls (Method or Cutting Edge Hybrid). In terms of reaction, the Tenacity Grit is my second earliest rolling ball behind my Kingpin Max. The strong layout is a major factor, but it starts up sooner with less change of direction than I see out of my Conspiracy, Quantum Bias or Kingpin Rule. This type of reaction is what I look for on fresh oily lanes, where I want to read the lane sooner, maximize the help in the earlier parts of the lane and control the shapes I see down the lane whilst the back ends are still snappy. I recommend this ball for bowlers bowling on slicker sport and challenge patterns. The Tenacity Grit will provide the early read and consistency to keep you in play, while the lanes are spotty. This type of reaction isn't very effective on most standard THS, but could be an option if the house is particularly slick of the bowler is of low track/high speed. The Tenacity Grit is my ball of choice for flat patterns and has earned itself a spot in my traveling tournament bag.